Every year, the Pan-Mass Challenge raises more than $30 million for cancer research and treatment through the Dana-Farber Cancer Institute’s Jimmy Fund. First held in 1980, the two-day event was the first fundraising bike-a-thon in the U.S., and now raises more money than any other athletic fundraising event in the country. In part, that’s because of the Challenge’s incredible efficiency—99 cents of every dollar raised by the more than 5,000 riders each year go directly to the Jimmy Fund. In 2006, Uta spoke at the riders’ dinner the night before the event started, and rode all of the first day’s 84-mile route. Now a two-day rider, she hopes that more people will join the PMC. 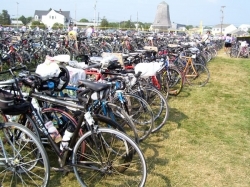 See below for reports from the 2006 and 2007 Pan-Mass Challenge. 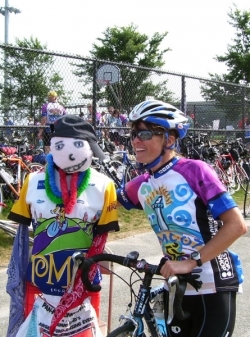 To learn more about the Pan-Mass Challenge, including how to contribute, visit the ride’s Web site at www.PMC.org. The Pan-Massachusetts Challenge just keeps getting bigger and better. Bigger, in that in its 27th year, the two-day fundraising bike ride across Massachusetts drew more than 5,000 cyclists, by far the most in the event’s history. Better, in that the riders are expected to raise $27 million for cancer research and treatment through the Dana-Farber Cancer Institute’s Jimmy Fund. That figure, too, was an event record, and means that the Challenge has raised close to $200 million since 1980. Tackling one of the first day’s routes, Uta rode 84 miles from Wellesley to Bourne. (Riders can choose to do one or both days, and have a choice of routes across Massachusetts. The two main routes cover 176 or 192 miles in two days.) “Although it was very humid the first day and tough on the riders, they all seemed to be in great spirits, encouraging each other the whole way,” Uta says. On the second day, the cyclists were blessed with beautiful riding weather of cool, dry air under a blue sky. First held with just 36 riders in 1980, the two-day event was the first fundraising bike-a-thon in the U.S., and now raises more money than any other athletic fundraising event in the country. For more information, visit the Pan-Massachusetts Challenge Web site at www.PMC.org. To help Uta help others by fighting cancer, you can make an online donation at this address: www.PMC.org/eGifts/. When prompted for Uta’s eGift ID, enter UP0001. More than 4,300 cyclists pedaled throughout Massachusetts last weekend to defeat cancer. The riders made up the largest field ever in the 26 years of the Pan-Massachusetts Challenge (PMC), which before this year had already raised $145 million for cancer research and treatment through the Dana-Farber Cancer Institute’s Jimmy Fund. With so many riders taking part this past weekend, this year’s fundraising goal of $25 million is sure to be met. Uta was one of many public figures who supported this year’s Challenge. Three-time Tour de France winner Greg Lemond rode, as did four-time Olympic gold medalist speed skater Johann Olav Koss and Massachusetts senator (and cycling aficionado) John Kerry. At a 2,800-person riders’ dinner the night before the first day of the Challenge, Soul Asylum stopped by for an impromptu concert, followed by “American Idol” star Alya Brown. First held with just 36 riders in 1980, the two-day event was the first fundraising bike-a-thon in the U.S., and now raises more money than any other athletic fundraising event in the country. For more information and to make a donation, visit the Pan-Massachusetts Challenge Web site at www.PMC.org. © Copyright 2008-2018 by Take The Magic Step®. All Rights Reserved.